A spontaneous standing ovation in response and with gratitude to Global Affairs Speaker Series presenters may not be absolutely unprecedented but nor is it a regular occurrence. But this October’s presentation by Atsikana Pa Ulendo (APU) or Girls on the Move School co-founders Pearson biology teacher Christie Johnson and Malawi-based co-founder Memory Chazeza Mdyetseni brought the house to its feet. Christie and Memory outlined the inspiring story of establishing a girls’ school from scratch, without a source of funding, before the first brick was pressed for a building and even prior to securing a piece of land for the school. “We didn’t even know how to fund-raise,” allowed Christie! Based on the success and growth of APU, Christie, who has been fundraising for the school for well over a decade – even though this was interrupted by a serious bout with cancer — was a fast learner. She, like Memory, who was scheduled to deliver at least 30 fundraising presentations during her three-week visit to Alberta and B.C., has been tireless in the pursuit of securing a long-term, sustainable future for a beacon of girls’ education in what is regarded as an impoverished nation. The school went from an initial enrollment of less than 10 to a multi-building residential campus that now houses and educates hundreds of girls at both primary and secondary levels each year. 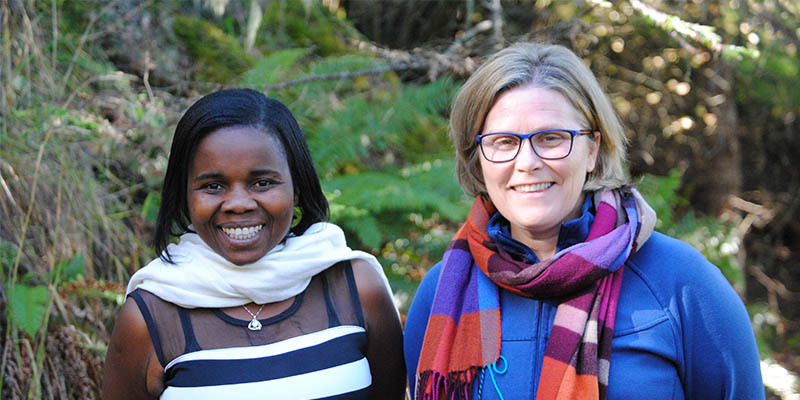 Other APU schools in Malawi may be on the horizon but Christie and Memory’s immediate priority is to ensure that the original institution continues to serve girls and young women without a need for long-term charitable support from outside the country. Memory noted that this is her eighth trip to Canada to raise awareness and support for APU, primarily through the continuing generosity of Rotary Clubs in communities across Alberta and B.C. Christie added that this is a particularly exciting push to self-sufficiency because a donor is currently offering a matching donation up to $100,000. Memory reminded the attentive audience of students, Pearson and local area community members that focusing on educating girls and young women is an investment in the future of an entire nation and a way to subtly lead citizens of all genders to a better understanding of how much intellectual and cultural capital is lost to societies that do not extend full equality and respect to females. Not one to miss an opportunity, Memory said she works with all teachers to help ensure they are role models for the students. The message gets across – and builds a culture of respect and a understanding on all sides that is having an outsized influence across the country.